My two least favourite things about my hometown are mosquitoes and mosquitoes. A close third, would be load shedding. For those of you unfamiliar with the jargon, it’s basically a daily state-wide planned powercut for saving unicorns. Or energy. Or something. I can’t remember the details except that it’s annoying. Especially that time it was scheduled to go off right in the middle of a Kung Fu Panda 2 airing on HBO. **Especially** when they seem to introduce the practice only when I’m home for vacations. So, let’s say you’re suffering from acute internetaddictionitis and the load-shedding kicks-in, leaving you hanging half-way through the Gangam Style video on Youtube, and also leaving you in the not-so-pleasant company of a squadron of mosquitoes. What do you do? Since there’s no such thing as negotiation when it comes to these miniature vampires, the only option is battle. Now these aren’t ordinary mosquitoes. These are mosquitoes that have been hardened in their craft through generations of exposure to mosquito repellents. I’m pretty sure that evolutionary processes have gifted them a gland that harvests these repellents and converts them into energy or some arthropod-adrenaline-equivalent. That said, mankind has had to resort to modern science in order to forge a weapon capable of taking on Satan’s pets. Behold! The constant-voltage-electro-plasma-weave-scepter-3000. Or, for the less scientifically inclined, the mosquito bat. Those of you who’re from less threatened corners of the known universe might find this piece of technology rather overwhelmingly difficult to understand. But here’s how it functions. The device works with the wielder holding the charge button, and swinging the device at a mosquito-monster, which upon successful contact, will deliver a very satisfyingly awesome spark thingy to the target. Sometimes, the target ends up stuck in the metal mesh, causing the mosquito to burn with the rather unpleasant odour of a burning mosquito. Whoever came up with this idea actually brought some fun into the endless and futile battle that routinely happens in most Indian households every evening. Anyhow, my entrepreneurial instincts tell me that there is room here for improvements. Turn these bats into Internet capable devices that can connect over WiFi, 3G, 4G, Parle-G, anything. Users register their device(s) through an online account. The device keeps track of the number of mosquitoes you pwn, and updates a score on a central server. The more you kill, the more you gain experience. As you gain experience, you level up. All users start at Lvl 1: Militia, and progress their way through to Lvl 100: Zeussian Mosquito Centurion Overlord. With each experience level, unlock features on your bat, like the anti-anthropod-plasma-cannon, and the zappa-mosquito-fragmentation-grenade-launcher. 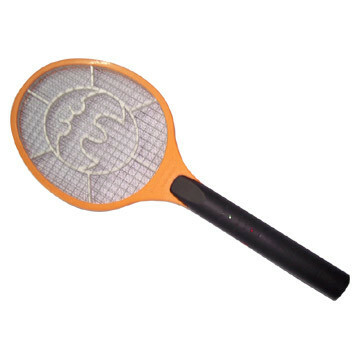 Compete with friends, family, neighbours, or fellow countrymen to slay as many of these buggers as you can in mosquito zapping tournaments. Win exciting prizes! See? No “?? ?” in between. Unlike other capitalistic endeavours, this one is purely driven by a social angle which can be summed up by three words, “Kill. All. Mosquitoes.” At the end of the day, we empower people with this device, and get rid of mosquitoes at the same time. Problem solved. Now to figure out how to solve the load-shedding problem. This entry was posted in Life, Non-Tech on October 21, 2012 by lalithsuresh. I see a little serial entrepreneur growing!